For a segment that attracts just over one in 100 Canadian new-car buyers, hybrid-powered vehicles are surprisingly top-of-mind for automakers. Few global carmakers have found the powertrain technology that marries a traditional gasoline-powered engine to an electric motor and battery pack hard to resist. 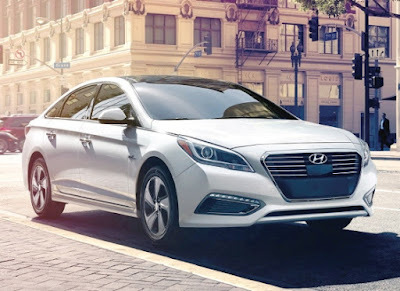 And so it was last week in this SoCal surf town that Hyundai Canada summoned Canada’s motoring press for the unveiling of not one but two all-new hybrid vehicles: the second-generation Sonata Hybrid and the company’s first-ever plug-in hybrid, also a Sonata. The former will be in showrooms in the summer, the latter by September. It was also announced that a hydrogen-powered, fuel-cell Sonata, an FCEV, will be coming to Canada, but not until fuelling infrastructure is better established. In Vancouver, Hyundai has leased out a handful of 2015 FCEV Tucson CUVs — all using Metro Vancouver’s single hydrogen fuelling station. But judging from my experience on the coastal drive down to La Jolla and back, expect to see plenty of the 2016 Sonata Hybrids and even a few Sonata Hybrid Plug-ins soon — particularly if fuel prices keep rising. On the 135-kilometre southern leg of the drive, my driving partner and I averaged 5.4 L/100 km in a top-of-the-line Hybrid Ultimate model; on the return trip home in the Hybrid Plug-in, we posted a fuel-sipping 3.3 figure. The mid-size Sonata sedan debuted way back in 1985, and last year the seventh generation was launched. The first-gen hybrid debuted in 2011, so it’s been five years since the powertrain technology has had a thorough update. In other words, forever in that ever-changing world. Hyundai has done a good job of improving pretty much all aspects of the Sonata’s parallel hybrid system. This includes a more robust yet lighter lithium-ion battery pack, a more efficient and lighter engine (and a smaller one, too, as a fuel-injected 2.0-litre four-cylinder replaces the 2.4-litre), a 10 per cent improvement in regenerative braking and a lighter transmission. On that latter point, the Sonata Hybrid is the only one in its segment to have an automatic transmission. The mid-size hybrid sedan competition — Ford Fusion, Honda Accord, Toyota Camry — all employs continuously variable transmissions. Power is down over the 2015 hybrid model to 193 horsepower, but from what I could tell, it’s at no detriment to the driving experience, which included always frenetic SoCal highway driving. Ironically, perhaps the biggest improvement to the hybrid system doesn’t even involve performance or fuel efficiency — it involves trunk space. The new Sonata’s battery pack has been moved under the cargo floor from behind the back of the rear seats, which translates to increased truck space to the tune of a class-leading 380 litres, some 36 litres larger than the outgoing model. In addition, the underfloor positioning of the batteries allows for a complete fold-flat configuration of the 60/40 split rear seat. None of the competition can offer that. True there is no spare tire — rather there is an inflator kit — but only the Camry Hybrid offers a spare in this segment. Passenger space is also best-in-class, as is front-seat headroom and legroom. And as much as you might expect that since the all-new seventh-gen Sonata came out last year, this 2016 model would simply be the same save for the hybrid powertrain, you’d be wrong. There’s 50 per cent more advanced high-strength steel in the 2016 hybrid model, which improves torsional rigidity by 41 per cent over the 2015 gas-powered model. In addition, there are a number of front and rear styling changes. Up front, there’s a different bumper, fascia, grille and headlamp shape; in the rear there is a new aero bumper, diffuser and taillight treatment. The sedan is slippery, too, boasting the best-in-class coefficient of drag (0.24), translating to lower fuel consumption and reduced wind noise. There are three hybrid models available: Base; Limited and Ultimate. The Sonata Hybrid Plug-in is available in just one trim level — the fully loaded Ultimate package. The only discernible visual differences between the plug-in and the regular hybrid are badging and the plug port on the fender. Apart from that, the vehicles are virtually identical. Driving them is a bit of a different story, as when fully charged the plug-in runs silent on electric power up to about 39 kilometres and has a slightly higher net power rating (202 hp). And that fuel economy is a difference too. No pricing has been announced yet, but expect the price difference between the Hybrid Ultimate and the Hybrid Plug-in Ultimate to be in the $6,000-$7,000 range.